Minardi's F1 debut was with a Ferrari! A tale of two Giancarlos, as this is as much a story about Giancarlo Minardi as it is about Giancarlo Martini. Say what? Well, yes, it's that easy, really. The uncle of his more famous nephews Pierluigi and Oliver was very much a part of Giancarlo Minardi's early days as a team owner, Scuderia Everest being Minardi's second serious exploit. Giancarlo Martini was born in Lavezzola, Italy, on 16 August 1947, and his career ran almost completely parallel to that of the other Giancarlo, his friend and compatriot Giancarlo Minardi, who is just one month younger. Their paths crossed as Minardi ran a simultaneous effort in the developmental Formula Italia class, next to the Faenza-based team's entry into F2 as the Scuderia del Passatore. The year was 1972 and Giancarlo Minardi had only just taken over the racing team of his family, having done a bit of racing and rallying himself. The newly-formed Scuderia del Passatore was very successful in F Italia, with 25-year-old Giancarlo Martini performing the driving duties. Martini was runner-up in the team's debut year and won the title outright in 1973. For 1974 the team was renamed Scuderia Everest and a pair of March-BMW 742s were acquired for Giancarlo Martini and Lamberto Leoni to drive. The Everest name reflected the increased financial injection made by Italian industrial rubber manufacturer Everest, which in the English-speaking part of the world has often been mistakenly regarded as a condom manufacturer, even on this site... Martini finished 16th in the championship, his only points-scoring race coming at Mugello where he took his 742 to fifth. For 1975 and 1976 the team continued in the European Formula Two Championship, racing the ubiquitous March-BMWs, with Martini going one place better in final the championship tables in 1975. 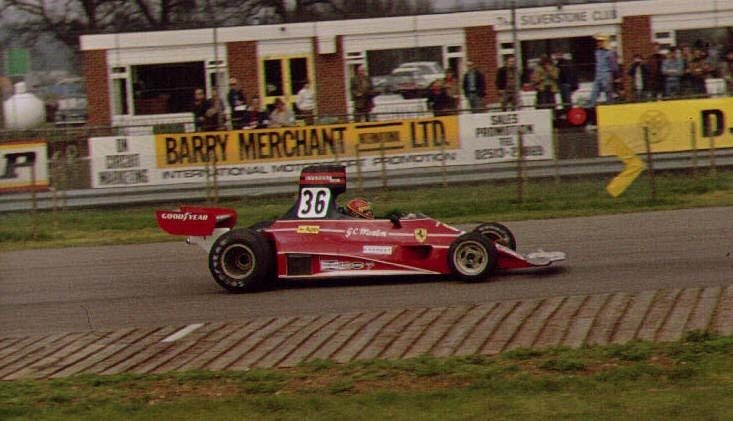 His best result of the season was a podium gained at Thruxton, outrunning Hector Rebaque for third in his March 752. The following year brought the curious deal related to our picture. On behalf on Scuderia Everest Giancarlo Minardi signed a three-year deal with Ferrari to enter a Ferrari 312T in secondary events with the aim to provide talented up-and-coming Italian drivers with F1 experience. The second part of the deal included the use of Ferrari Dino V6 engines in Formula 2 for '77 - and this was the part that was eventually honoured and even carried through into 1978. Scuderia Everest ran the loaned Ferrari 312T-021 for Giancarlo Martini in the Daily Mail Race of Champions at Brands Hatch and in the International Trophy at Silverstone dedicated to the bereaved Graham Hill - these were the year's only non-championship events. Effectively, twese two entries were Giancarlo Minardi's first foray into F1 before he would enter Grand Prix racing under his own name almost ten years later. However, Martini managed to shunt the 312T on the warm-up lap at Brands and only drove it briefly at Silverstone. The experiment, which effectively also was the last privateer Ferrari entry, was not repeated. Wisely, Scuderia Everest decided to concentrate on their Formula 2 efforts. Giancarlo Martini did a better job in F2 and finished seventh in the final Euro F2 standings in 1976, coinciding with an Italian F2 title. Martini's best result came during the showdown in the streets of Pau, finishing third in his March 762-BMW. The Scuderia Everest team also entered cars in the Euro F3 championship, proving itself a force to be taken seriously, as Gianfranco Brancatelli finished third in the '76 championship behind Riccardo Patrese and Conny Andersson but ahead of Marc Surer among others. For the coming Formula 2 season the bespoke Ferrari Dino engines would be coming along, with Lamberto Leoni and Gianfranco Brancatelli being signed to drive the Ferrari-powered Ralt RT1 cars. Alongside Leoni and Brancatelli Giancarlo Martini was run in a Renault V6 powered Martini (!) MK22. The Ferrari Ralts failed to bring home any results for Minardi, the team switching to Chevron B41 chassis mid-season. It was hardly an improvement, apart from a freak win on aggregate by Leoni at Misano. On paper Martini's Martini should have been a competitive proposition. The works Ecurie Renault Elf cars driven by René Arnoux and Didier Pironi were top runners all year long, René winning the '77 Euro F2 title by a country mile. But for Giancarlo Martini the season was a disaster. His best result was a meagre eighth spot at Nogaro while several retirements also hampered his campaign. After the difficult '77 season and a total of 22 points earned in his European Formula 2 Championship career, Giancarlo Martini now quickly faded from the scene. For the '78 season Minardi continued with the Dino-engined Chevrons. Youngster Elio De Angelis raced the B42-Ferrari without success while Argentinian Miguel Angel Guerra handled a BMW-powered B40. De Angelis was unimpressed by the Ferrari V6 and wanted a similar BMW to the one his team mate Guerra enjoyed. The disagreement turned to heated argument and Minardi's sacking of De Angelis. The fast Italian was duly picked up by the works ICI Chevron team... Veteran Swiss Clay Regazzoni was brought in to help the team in the BMW-powered B40 vacated by Guerra. The move meant that Guerra now ended up in the Ferrari-powered car! Minardi continued in the category for an another year in '79. The Ferrari experiment ended, leaving the Scuderia Everest to bring in those BMW-powered Marches again. The 792 models were campaigned all year for Gianfranco Brancatelli and Miguel Angel Guerra, with Regazzoni once again doing the occasional race. Having seen his team going nowhere for the last couple of years, Giancarlo Minardi decided to jump on a new challenge. He contacted former Ferrari engineer Giacomo Caliri in Bologna and together with Caliri's FLY Studio Minardi would re-enter the Euro F2 Championship, fresh for the new decade. The Minardi and Caliri partnership produced pretty cars with BMW power until the Formula 2 category closed for good at the end of 1984. Their best result was a win at Misano in 1981 with Michele Alboreto. Instead of going the F3000 route, Minardi would take the final step on the ladder: some nine years after his abortive Scuderia Everest adventure in '76 he was back in Formula 1. A new generation of the Martini family was now sitting in Minardi's car. Giancarlo Martini's teen-age nephew Pierluigi had been given the opportunity and honour to drive the Caliri-designed M85. Turbo power came from Carlo Chiti's Motori Moderni V6 engines, and while it was all too early for Martini and Minardi - Pierluigi's debut-year experience even forcing him back to two more career-rebuilding years of F3000 - they kept their faith, earning their their first Championship points together three years later in 1988 when Pierluigi brought his Cosworth-powered M188 home a fine sixth at Detroit. In 1991, Minardi renewed his relationship with Ferrari when his Grand Prix team was supplied with customer V12 powerplants from the Prancing Horse. But nothing more than a couple of fourth places by Minardi stalwart Pierluigi Martini at Imola and Estoril could be achieved. This was good enough to finish eleventh in the final championship standings for '91. Pierluigi would remain in the team until the end of 1995. Two years later in December '97 another member of the Martini family sat in a Minardi. This time it was the younger brother of Pierluigi, Oliver, who got the opportunity to test a Minardi M197-Hart V8 at Barcelona. This was thanks to the Italian Formula 3 title he snapped up in the same year with a RC Motorsport Dallara-Opel F397. Oliver would drive in the FIA F3000 series in 1998 and 1999. The ultra-competitive F3000 series did not bring any results for Oliver and for 2000 he had to take a step down to the Italian national F3000 series. Some sixteen years after Minardi's F1 entry, after a few ups but mostly downs along the twisty road, the Minardi team is still trying to hang on to the ever faster F1 train. They have been the perennial backmarkers for the last five years or so. While most of the lesser teams have dropped out due to financial difficulties Minardi have miraculously remained a part of the F1 community. Team founder Minardi himself plays a lesser role in the team than previously. Both Flavio Briatore and Gabriele Rumi bought out parts of Minardi's stake during the mid 1990s. For this year (2001) the team was acquired by Australian businessman Paul Stoddart, with Giancarlo Minardi being demoted to the role of director of young driver development. In these times of increased manufacturer involvement in F1, it can only be a matter of time before the Minardi name will become part of the history books as well. Giancarlo Martini is seen here in his one and only Formula 1 race. If you're going to have only one race and you're Italian, it might as well be in a Ferrari! It should have been his second outing, but he had blotted his copybook the previous month when he crashed his 312T at Brands Hatch during the warm-up for the Race of Champions and posted a DNS, having qualified next to last. Not an auspicious start to a career with Ferrari, and probably the reason he never got another chance at the highest level. At Silverstone, he qualified tenth, finishing in the same lowly position: two lacklustre performances which were hardly guaranteed to have Enzo Ferrari rushing to offer him a contract. Martini's entry was made in the name of Scuderia Everest, a Fiat/Ferrari joint initiative allegedly to help develop young Italian drivers reach the top: Martini was nearly 29! This arrangement is reminiscent of the FISA team, which brought Giancarlo Baghetti to Ferrari in 1961, winning his first three Formula 1 races. The name, however, provides possibly unconscious humour, in that Everest is probably the size of the mountain of difficulties that an Italian driver will have to surmount before we see another Italian World Champion! Unbelievably, it is nearly fifty years since Ascari clinched his second title, the last Italian to do so. Martini is better-known as a Formula 2 driver and 1976 was to prove to be his best season in that class: he finished equal seventh in the European Championship although he was well behind champion Jean-Pierre Jabouille. The following year he drove an old Ensign MN175 in the Aurora Championship, actually scoring a win at Donington Park - this would prove to be the high point of his career. Giancarlo's career was later overshadowed by that of his nephew, Pierluigi Martini, who had the resilience to drive for Minardi for several years, scoring their first ever Championship point and, for one glorious lap during the 1989 Portuguese GP, actually leading a race in a Minardi (no, that's not a fantasy - it really happened!). Giancarlo's other nephew, Pierluigi's brother Oliver, has also raced, reaching Formula 3000 after lifting the Italian F3 title in 1997. In addition to being Martini's only race, this was also the last race for the classic Ferrari 312T, the car which turned the fortunes of the Scuderia in the mid-Seventies. Niki Lauda's win in the 1975 Drivers' Championship was the first for Ferrari since 1964 and with the help of Clay Regazzoni, the Constructors' title also returned to Maranello. Lauda took five wins and Regazzoni one during the season as Ferrari came to dominate the year. They resumed where they had left off in 1976, using 312Ts to win the first three races (Lauda two, Regazzoni one). Then the improved 312T2 arrived, winning second time out in Belgium in the hands of Lauda, who followed up with a win in Monaco - if James Hunt's disqualification in Spain had been upheld, the 312T2 would have won its first race too!